I get fomo (fear of missing out) when I see the new drinks at Starbucks. Some of them aren’t even vegan, but I love the idea of incorporating new flavors into my favorite foods and drinks. 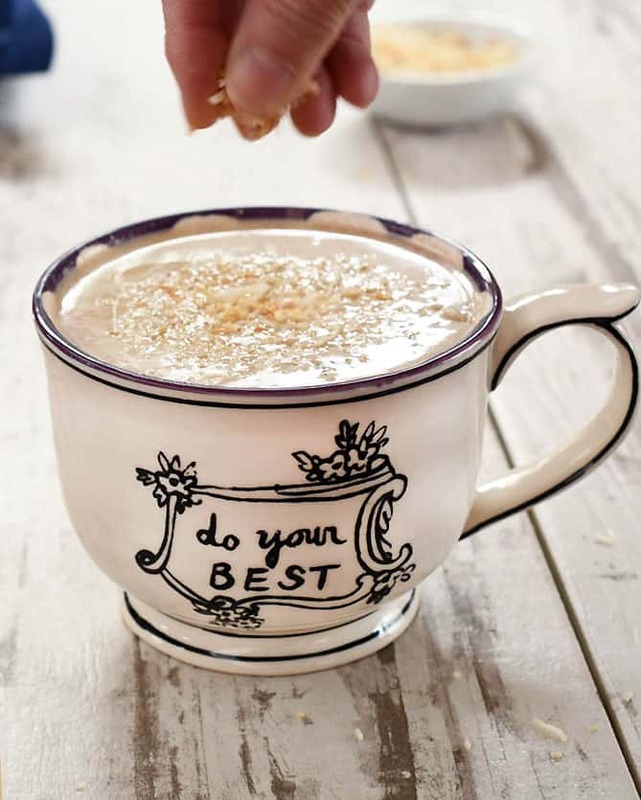 When I saw their Hazelnut Mocha Coconut Milk Latte I knew I need to recreate it at home. I’ve been weaning myself off caffeine the past few months. Some mornings I’ll have a matcha latte or a half-caf coffee, but more mornings I’m having a cold-brewed coffee substitute like Teeccino or other grain-based blend. The thing you notice when you’re cutting something out or even limiting it is how it is everywhere! You can’t get a decaf Frappuccino at Starbucks much less one that’s sweetened with something besides sugar or Splenda. Plus there’s no more regular iced tea at dinner, somehow I never even counted that before. One thing that’s great is you can make cold-brewed Teeccino just like you do cold brew coffee. I make a batch every week so I can just reach in the fridge and make my morning drink. I haven’t made a hazelnut syrup yet, but making this toasted hazelnut milk really gives this drink a hazelnut flavor with no added sugar. I think that toasting the coconut makes it taste a little stronger too. 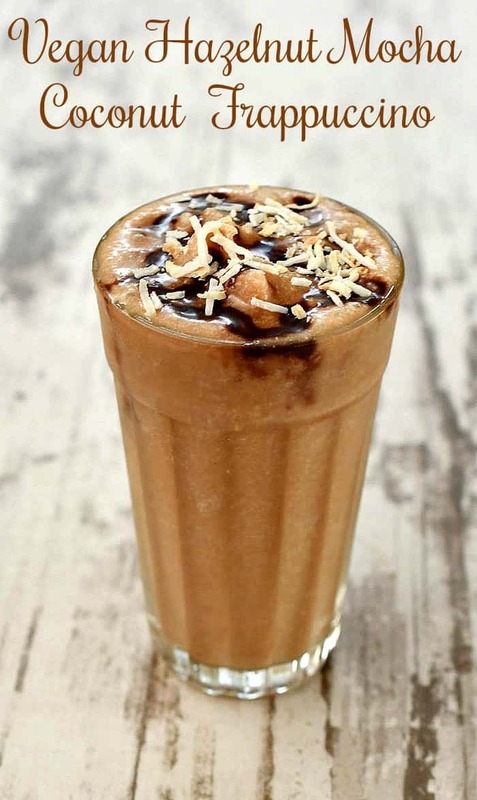 To make the latte all you need to do is add some cold brew and mix in the Toasted Hazelnut Coconut Milk until it’s the strength you like it. For me it’s 1/4 cold brew to 3/4 nondairy milk. Then add a squirt or two of chocolate syrup. If you aren’t eating sugar try NuNaturals NuStevia Cocoa Syrup, it’s sweetened with stevia and it’s what I used. Want a frappuccino instead? 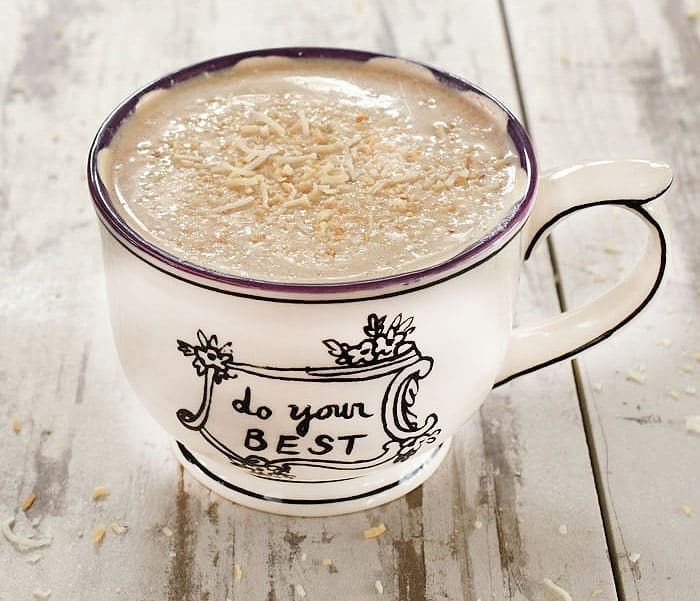 Add the latte mixture plus a pinch of xanthin gum or 1/2 teaspoon ground chia seeds to your blender and blend well. Add crushed ice and blend until it’s as thick as you like it. I like mine very thick so I do about 1 cup ice to 1 cup latte blend. Use this as the base of your new favorite coffee drink. Add cold brew and some chocolate syrup. 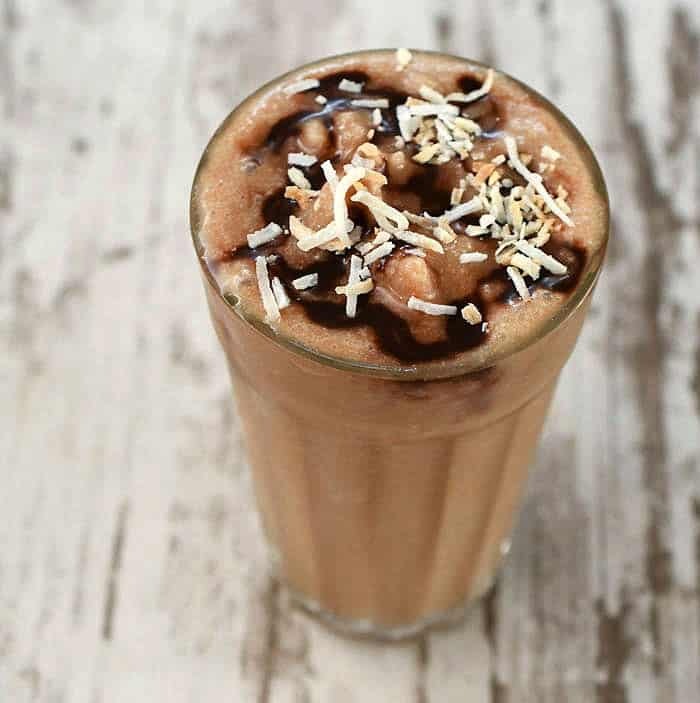 Drink it hot, as an iced latte, or make it into a frappuccino by blending with crushed ice and a pinch of xanthan gum or 1/2 teaspoon ground chia seeds. Place all the ingredients in a blender and blend until smooth. Strain through a fine mesh strainer or nut milk bag. Store in the fridge and shake or stir before each use.